Big fish, small flies, fine tippet and prolific hatches sum it up. The "Mighty Mo" is perfect for the dry fly enthusiast and for anglers that want to put their skills to the test. The Missouri River contains several dams along its journey, making most of the river a tailwater (flowing from a reservoir out through a dam) fishery. Its rich aquatic life allows rainbow and brown trout to become very large in size. We offer drift boat trips below Holter Dam, near Craig Montana, and for the past 15+ years Trout On The Fly, LLC and its select team of U.S Coast licensed captains offer jet boat trips in LAND OF GIANTS (L.O.G. ), below Hauser dam, only 20 minutes north of Helena Montana. L.O.G. is mostly a rainbow fishery averaging 18″-22″ in size, a miniature steel-head if you will. Are you an experienced angler that needs to be challenged? 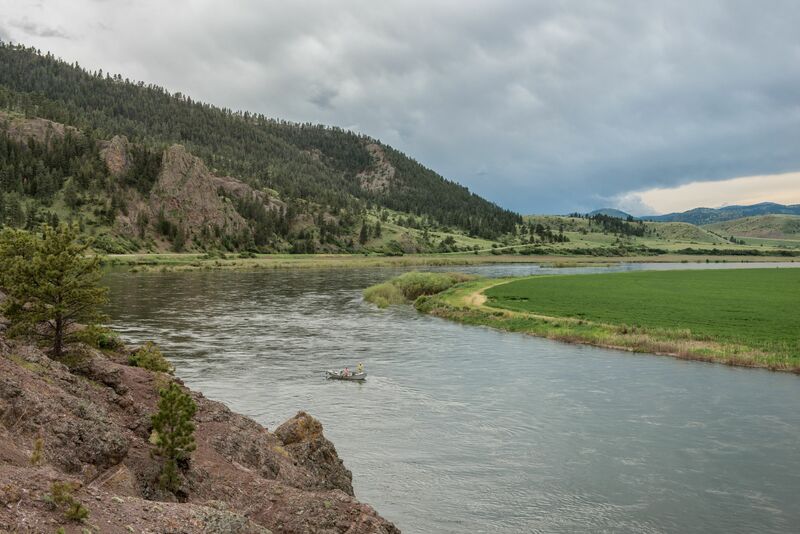 Look no further, this is the place to test your skills – The upper stretch of the Missouri River (the “Mighty Mo”) from Toston, MT to Townsend, MT, has very calm moving water with large spooky rainbow and brown trout, requiring long accurate casts delivered smoothly. To give you an idea of how spooky these fish can be if an angler slaps the water with the line or is dancing the two-step in the boat while casting, the fish are not going to hang around. However, the payoff can be large. Using mostly dry flies, rainbow and brown trout will average 20 plus inches. Did I mention Carp? Yes, the Common Carp (Cyprinus carpio) is a wild species introduced from Eurasia into Montana’s rivers and lakes. Taking a carp on the fly is as challenging, if not more so, than taking a trout. Carp are becoming increasingly sought after with the fly, and for good reason. Most carp in the “Mighty Mo” average 8 pounds and know how to use that weight to their advantage. If the name “Land of the Giants” does not get you excited, then maybe the chance at a 24″+ trout will! As one of a select few licensed U.S. Coast Guard Captains, Captain Nate Stevane and his team of captains offers a special Jet Boat trip on the Missouri River. The jet boat is set up like a drift boat with oars, anchors and knee locks, and is used to motor up river to areas where you cannot launch a drift boat, and then float back down. The Missouri River is very large, and walk-n-wading from the bank limits your area to fish, not to mention the difficulty of trying to land a “Giant” that runs out into the current. Using the boat we can chase large fish if needed, and bring them to the net. Jet Boat fishing on the Missouri River is best in April and May, mid-October through November. Mostly a rainbow trout fishery averaging 18″-22,” this trip is a must! Holter Dam to Cascade is considered a Blue Ribbon section, known for incredible Trico hatches from late July to early September. 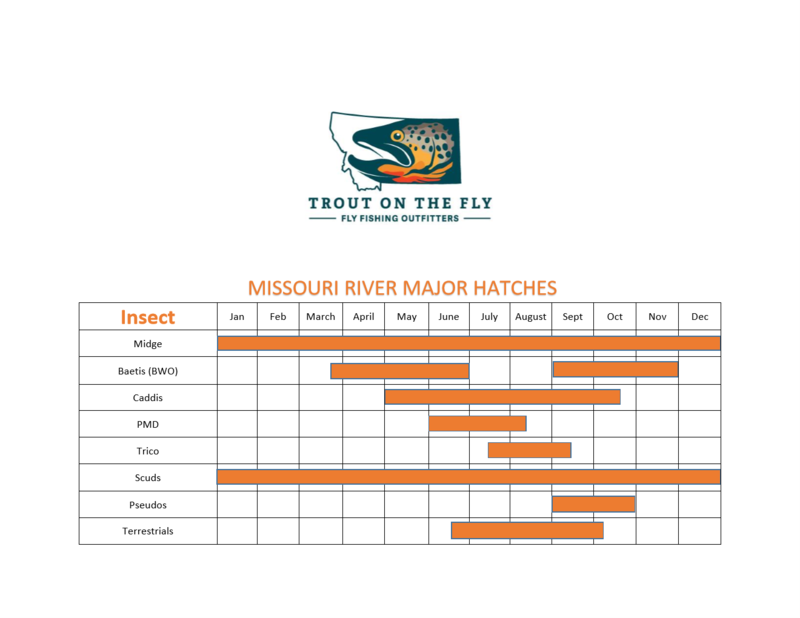 PMD’s, Baetis, caddis and midges are other well-known hatches to keep an eye out for when fishing the “Mighty Mo.” 5x and 6x tippet is not uncommon when trying to match these hatches, and for the extremely wary fish 7x might be needed. Floating in a drift boat is recommended for this section. At Trout On The Fly, we are happy to make recommendations for lodging based on the section of river being fished. Nate is the gold standard for fly-fishing guides and outfitters. As a 15 year client, I've benefited from his exceptional skills, stream knowledge and judgment on seven major Montana rivers, 2-3 times/year from my home in the East, and there's always a new stream or section to experience. I've never had a bad outing: whether walk-wade, float, or jet boat on the Missouri - all memorable, fresh, and productive, and in every weather condition. Nate is that rare person whose interpersonal skills complement his knowledge of the sport, to the benefit of the client. Safety is always paramount, and he is indefatigable. Nate is simply the best, and time after time he's provided me with an unforgettable Montana fly-fishing experience.